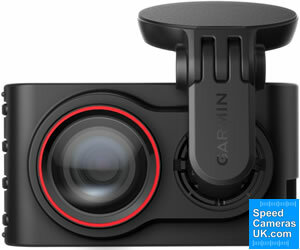 Garmin Dash Cam 35 performs two very different but useful fuctions all while it's mounted on your vehicles windscreen. 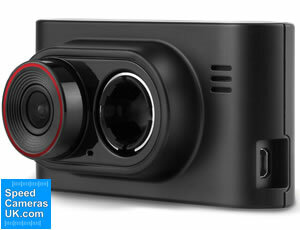 Firstly, the Dash Cam 35 features a full HD 1080P in-car camera to record traffic incidents. Secondly it alerts to speed cameras via a optional subscription. ‣GPS technology records speed, location, etc. The Garmin Dash Cam 35 is a dashboard camera that features Full HD recording and a 3.0-inch LCD screen. 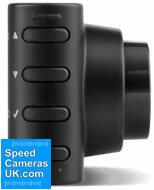 The Dash Cam 35 will record in continuous loop by recording over old videos to ensure you are always recording. GPS technology built-in to the dash cam also records information such as location, direction, speed, date and time so you will always know where and where an incident happened. The recorded video can be played back on the 3.0-inch screen or on a PC or Mac computer. Recording is made with a wide-angle lens ensuring you capture all events in the road ahead. There is also an integrated microphone that will record commentary and sounds inside your vehicle. The Garmin Dash Cam 35 has a built-in G-Sensor that in the event of a high G-Force will automatically save footage before, during and after the event. The Dash Cam 35 accepts microSD cards up to 64GB in size and it will record excellent video quality in bright and low-light conditions. You can select to record in either 1080p Full HD or 720p. If you opt to record in 720p then you will extend the recording time capacity on the microSD card. Optional extras for the Garmin Dash Cam 35 include a speed camera database as well as warning to red light cameras. Included with the dash cam is a forward collision warning that alerts you if you are driving too close to the vehicle in front. 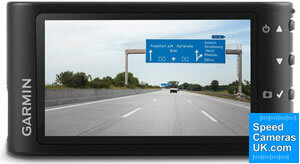 Garmin Dash Cam Player Software is free to use that will allow you to view and organise files captured by your dash cam 35 which is compatible with PC computer and Mac computers. A windscreen mount is provided to mount the Garmin Dash Cam 35 to the windshield. Protect your motoring insurance no claims bonus by ensuring you have documented evidence of incidents that happen on the road. You will also have piece of mind as you will capture all events. ‣Mobile speed camera locations as included within the downloadable Garmin speed camera database provided by Cyclops. ‣Collision warning. Alerts you when you are driving too close to the vehicle in front. Learn even more about the Garmin Dash Cam 35 by reading the manual. Click the PDF logo below. The manual opens in PDF format. Garmin Dash Cam Player is a software program that is compatible with both Windows and Mac computers. View the videos recorded on your Garmin Dash Cam 35 recorder for free. Garmin Dash Cam 35 - What's in the box?